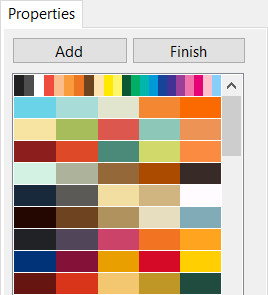 The Palette Selection command allows you to select a color palette from the image (maximum of 5 colors) or to choose a color palette from the list.The small window shows the color palette, the currently selected color, the RGB (Red, Green, Blue), HSB (Hue, Saturation, Brightness), and CMYK (Cyan, Magenta, Yellow, Key) values. Use the left mouse button to add a color to the color palette. 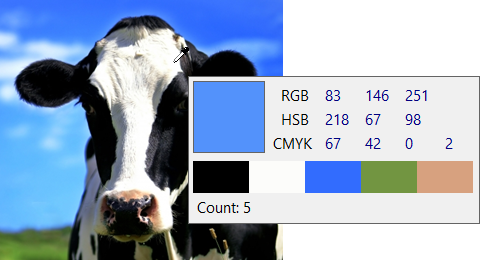 Use the right mouse button to replace the current color in the color palette. Use the buttons to add the color palette or to complete the action.